The 38th annual Concours d’Elegance, to be held July 29-31 at The Inn at St. John’s in Plymouth Township, will feature a variety of events including tours of automotive history sites, an automobile auction, an updated display of antique and classic vehicles, and more. With an expected attendance of nearly 14,000 people, activities begin on July 29 with the Motor-Coach Tour. The guided tour, which begins at 8:30 a.m., will visit the Boston-Edison historic district where Henry Ford once lived; the Ford Piquette Avenue Plant, the former General Motors headquarters, and Frank Lloyd Wright’s Dorothy Turkel house — all of which are in Detroit — as well as the Highland Park Ford Plant where more than 15 million Model Ts were built. A separate event, the Hagerty Motoring Tour, will begin at 9 a.m. Collectible automobile drivers will travel to Chelsea to tour the Chelsea Millings Jiffy Mix Plant and meet former racecar driver Howdy Holmes. 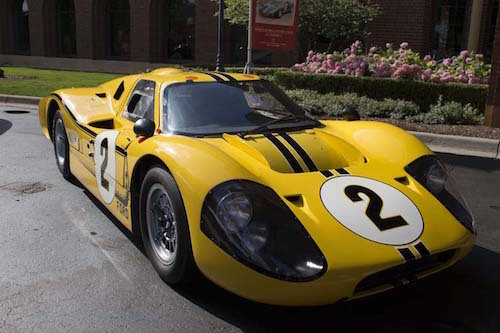 Other events on July 29 include the RM Sotheby’s Motor City auction preview; an invitational art exhibition; and the Kip Sheward Motorsports’ battle of the brands, where guests will bring their sports car or motorcycle to compete to get the most of one brand. Events on July 30 include LBI Limited Cars and Coffee; the Hagerty Seminar Series; RM Sotheby’s Motor City Auction; Italian Happening (a display of Italian vehicles); the Inca Tea Tip Your Hat luncheon; and Concours d’Lemons, a display which will feature past vehicles such as the Ford Pinto and the AMC Gremlin. RM Sotheby’s Motor City Mingle dinner, cocktails, and auction will also be held on July 30. Mitch Ryder and the Detroit Wheels will provide the entertainment for the evening. The Concours d’Elegance of America will be held on July 31 and feature more than 300 vehicles, including a performance class that offers five GT40s to celebrate the vehicle’s 50-year-old victory at Le Mans and the featured class showcasing cars designed by Raymond Dietrich, jet-age travel trucks, personal utility vehicles, and Pierce Arrow cars. To learn more about the Concours d’Elegance, visit concoursusa.org.